Brown is the color of Tilcara, but don’t let that deter you from staying for at least a few days. 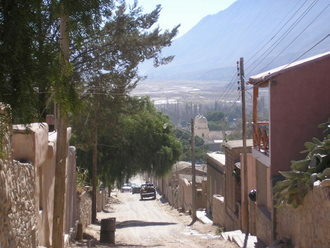 Nearly half way between Salta and the Bolivian border, Tilcara has been host to humans for over 6,000 years. 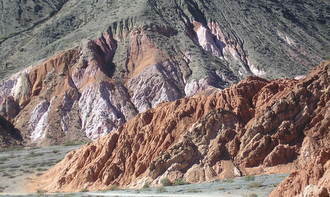 Set in the middle of the UNESCO World Heritage site of Quebrada de Humahuaca, Tilcara’s brown adobe buildings, brown mud or tan stone streets and dusty countryside is a beige backdrop for the stunning multi-colored reds, greens and pinks of the surrounding Andes. 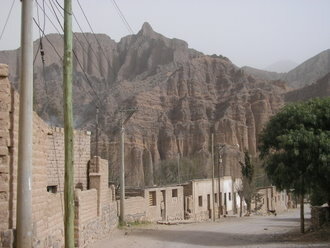 The Quebrada de Humahuaca is a narrow valley of unique, and towering, rock stratifications that run 170 miles from the high Alto Plano of western Bolivia to the city of Jujuy in Argentina. 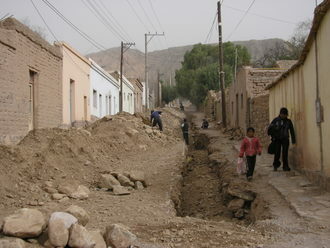 Along the river valley, Andean people established numerous villages thousands of years ago. They eventually built fortified stone settlements such as Tilcara's El Pukara that housed well over a thousand residents, channeling the river water to irrigate fields, and creating a sophisticated society with craftsmen and artist. By 1500 the Inca Empire had expanded a 1,000 miles south from their Peruvian heartland to incorporate the Quechua culture of the Quebrada. Even though the Inca established their economic dominance another 800 miles south into present day Mendoza Provence (Argentina) they never fully altered Quechua traditions. In the late 1500’s the Spanish Conquistadores had even less luck changing the Quechua culture, but they did subdue and enslave the people. 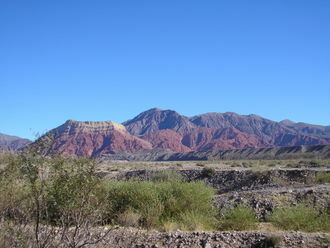 The Quebrada was a direct route from the silver mines of the Bolivian Alto Plano to the new Spanish colonial cities of Jujuy, Salta and Mendoza. Many indigenous people were forced to work in the mines or on plantations. Yet everyday cultural traditions changed little even when forced to convert to Christianity. 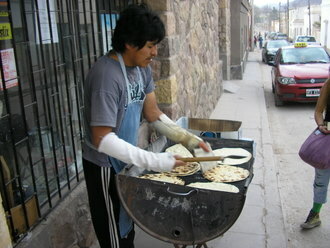 The Quechua learned to cope and adapt. 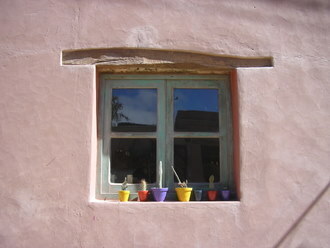 The brown of Tilcara is also a foil for the bright colors of indigenous handicrafts. 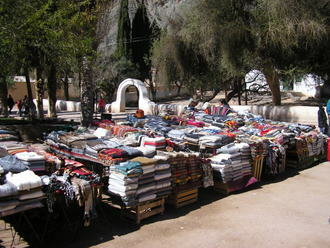 Multi colored garments made from soft alpaca and llama wool are sold in abundance in the daily market on the main Plaza, along with many forms of pottery with designs created eons ago. 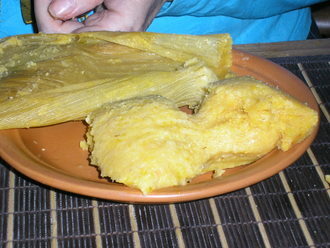 Andean and Argentine Spanish music fills the Plaza and the food stalls sell humitas - a creamy corn and cheese mixture wrapped in corn husks - empanadas - an Andalucian savory pastry first made by the Moors - fresh grilled tortillas and the incomparable Andean goat’s milk cheese Queso de Cabra. 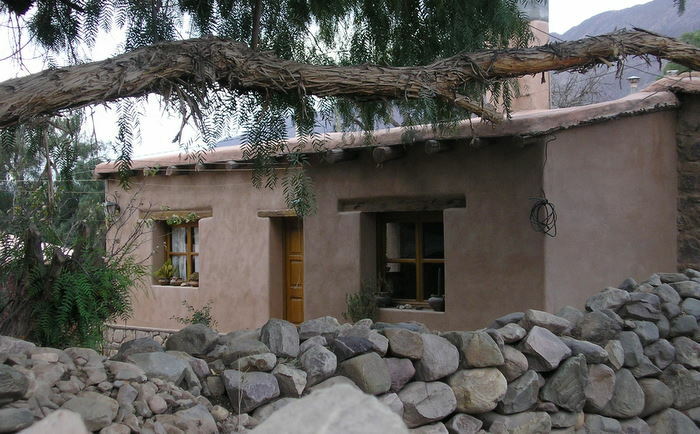 The streets are lined with adobe houses, some hundreds of years old, and yet many of the new buildings are still made in the same manner. 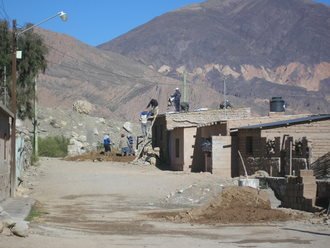 These thick mud and straw walled buildings create an amazing insulated environment that keeps out the scorching heat of the summer but retains heat during what can be bitter cold in the winter. Adobe is very resilient during earthquakes. Interior walls are often painted, decorated with wall hangings and other art. 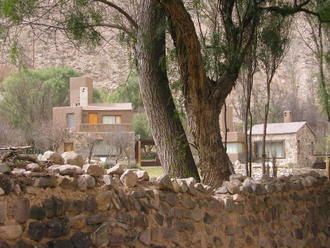 A sophisticated tourist industry has developed in Tilcara attracting many artist from around Argentina. 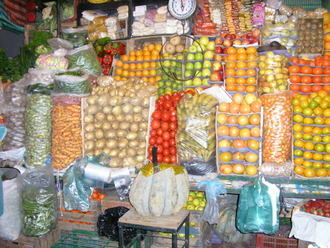 Shops selling unique jewelry, paintings and crafts are common in the town. Very comfortable small hotels and inns are frequently booked solid on weekends year round and during the summer tourist season. Of special interest is Posada Con Los Angeles and Restaurant. Good restaurants are numerous and many have local musicians playing at night - Restaurant Neuvo Progresso 1917, Restaurant Qomer and Restaurant Los Puestos. 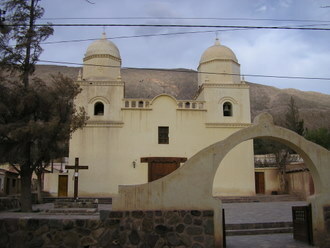 Tilcara is an excellent base to explore the surrounding Andes and interesting villages with an equal history - Uquia, Purnamarca, Humahuaca, Iruya and Salinas Grande. 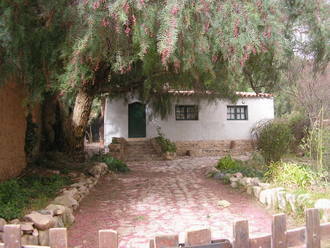 The peacefulness of Tilcara is pronounced. 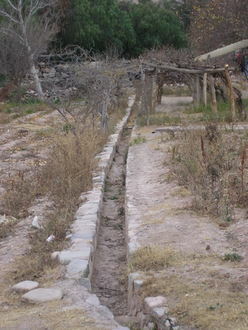 Silent construction typifies the building activity of adobe houses as much of the labor involves human hands, not power tools. At night, the sound of a few dogs may break the calm. In the morning, roosters greet the Andean sun.